Thirty firefighters were trying to bring the fire under control at 8 a.m., nearly an hour after it was reported at Acme Grocery. A passerby called Richmond authorities about 7:10 a.m. to say there were flames coming from the store, which is located at Venable and Mosby streets on a block of row houses. UPDATE: Check out photos of the fire from across the street! I live across the street and called at 7:11 AM. I woke up, smelling burning. After running around the apartment, I looked out the window to see flames. The place is gutted now. No one was in the building. This is the second fire on this corner in the past few months. I’m gearing up to walk up there to get a photo. I wish I had a horse, my bicycle is worthless in this weather. This is that other recent (suspicious) fire at that intersection. Thanks Will, your photos are fantastic! Thanks, they’re out of my bedroom window. Didn’t think to take pictures until after the fire department arrived. Great shots, Will! I think if there was a fire across the street from me, I probably wouldn’t remember to take pics at all, so you were real timely with these! …and the really great people whose house is attached to the store are ok. No water or fire damage to the house or its contents, ‘tho they tell me the smell of smoke throughout their home is almost unbearable. They are just now closing the doors and windows because it is too cold to leave them open any more. In the past year there have also been fires in the apt. office across the st. and right around the corner on 22nd. WTF. So glad to see that no one was hurt. Any idea what caused it? 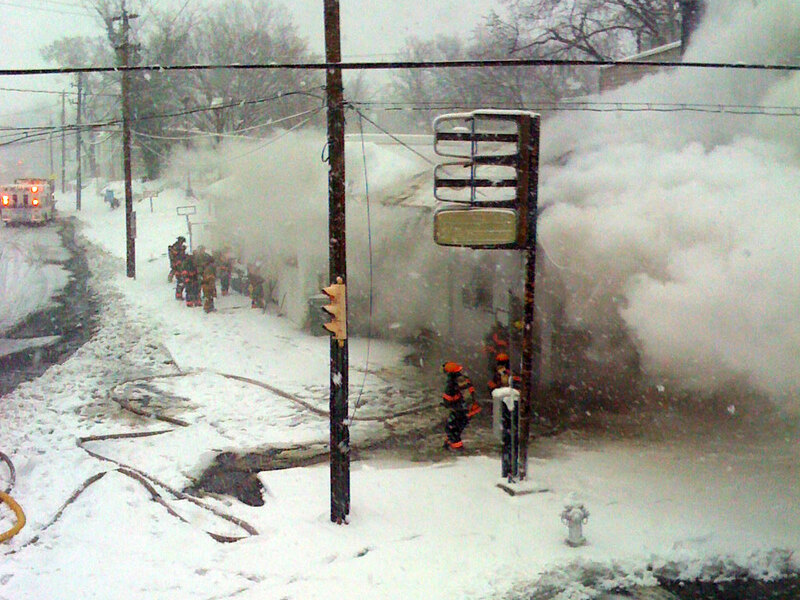 Richmond, VA- At 7:09 a.m. on March 2, 2009 the Richmond Fire Department responded to a reported building fire at the intersection of Venable & Mosby Streets. The first arriving company found heavy fire and smoke and upon entry firefighters were met with deteriorating conditions that forced them out of the building to provide a defensive attack from the outside. Additional units were called to assist once fire was reported through the roof. The fire was marked under control within an hour. The Fire Investigation team feels confident the fire was accidental as it was deemed to be electrical in nature. For more information about this incident, contact Lt. Shawn L. Jones 646-2502. The City of Richmond Department of Fire and Emergency Services provides smoke detectors and batteries free of charge to residents of the city. Fire fighters will respond to any homeowner in the city and install a smoke detector and/or battery at their request. Smoke detectors and or batteries are delivered to customers between the hours of 8 a.m. – 6 p.m.
For further information pertaining to free smoke detectors, please call 804-646-1526. I thought it was up for sale and there was someone interested in reopening it but also see that was 4-years ago.